Emily Stone leads hundreds of students during The Union's summer yoga series. When looking for yoga, you don't have to think of a studio or gym, and when you do, it can often be more creative and accessible than you think. Dozens of classes around Spokane offer students the chance to bend, stretch, pose and practice while outside, on the water, and even before drinking beer together. 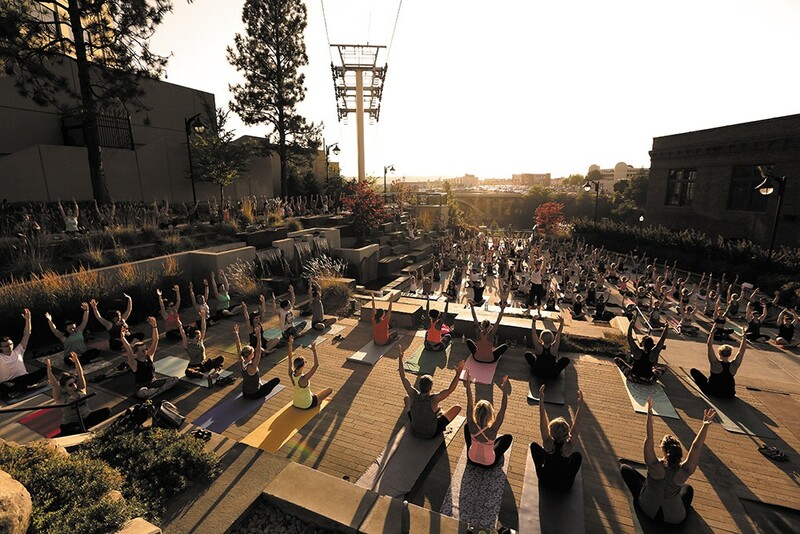 Back again, The Union has teamed up with Downtown Spokane Partnership and Numerica Credit Union to offer a free outdoor summer yoga series, hosting an evening class at the Spokane Tribal Gathering Place next to City Hall once a week from July through the end of August. Get limber with the setting sun as the group meets at 347 N. Post St. For 2018's sessions, check The Union's Facebook page. What takes more coordination than yoga or stand-up paddleboarding? Yoga on a stand-up paddleboard, of course. With life jackets on board and water to break your fall, the SUP Spokane yoga courses offered in partnership with Mellow Monkey Yoga are sure to push your boundaries while giving you a unique experience on the water. Classes are announced as weather allows throughout the summer, and you're asked to pre-register online for the $40 session at MellowMonkeyYoga.net. What could be better than getting loose and mellow on a Saturday morning? How about capping it off with a nice, cold beer? Bottoms Up Yoga at The Lantern Taphouse offers just that, taking people through a 50-minute flow yoga class for all skill levels at 10 am before the pub opens, then gathering for a pint (included in the $15 class cost) afterward. "It's lighthearted. It's not serious — we don't do a lot of meditation or anything," explains Mandi Anderson, the certified instructor who leads the classes and also works as a server and bartender at the Lantern. "It's just a nice way of limbering up to start the weekend." Keep an eye on the Bottoms Up Yoga Spokane Facebook page for a class schedule. If you're older than 50 or aren't able to pose on the ground, fear not: Mellow Monkey also plans to offer a couple of fall series that make yoga as accessible as possible, says Mellow Monkey owner Sara Teal. "Our goal is to try and be as inclusive as possible to the people who are kind of like the yoga outsiders, that are not going to just show up at a studio for no reason unless they think something is going to work for them," Teal says. The studio plans to offer a chair yoga series that will have students pose while seated, and another series will be geared for folks over 50 who are newer to yoga, Teal says. At 10 am every Sunday, Nicole Lang offers a free community yoga class at Manito Park, in the open space on the lawn near the parking lot at 18th Avenue and Grand Boulevard. She hopes to keep the courses there as long as weather permits, then hopefully move them somewhere inside when winter hits. Lang is a certified instructor, passionate about making yoga accessible to people through free and donation-based classes, and she also teaches with a trauma-informed perspective. She trained with UpRising Yoga in Los Angeles, a group that brings free yoga to at-risk youth in that area, and now offers trauma-informed yoga to girls who are in their first weeks of addiction treatment with Daybreak Youth Services. "The yoga allows them a safe place to reconnect with their body in a physical and emotional sense, and gives them tools to reconnect and feel more empowered in their body in their everyday life," Lang says. Although the classes at Daybreak are not open to the public, Lang says she brings elements of that trauma-informed practice to all her classes. Find more information on Lang and her schedule at RiseAndAlign.com.